I am all over this! Two of my favorite things... Gilt.com and VW. It's time for me to upgrade my Jetta anyway and for $6000, it's a no brainer. NEW YORK, NY - December 13, 2010 – Beginning December 15th, Gilt Groupe, partnering with Volkswagen of America, will sell three all-new 2011 Jettas to its members. Each day beginning at noon ET, one car will be sold at an affordable price of $5,995. Volkswagen dropped the "1" from the incredible starting price of $15,995, further delivering on its "Great for the Price of Good" message. The flash sale will occur on three consecutive days. Volkswagen is the first automotive brand to be sold on Gilt, or any flash sale site in the U.S.
"We are extremely excited to be partnering with Volkswagen to sell the all-new Jetta," said Carl Sparks, President, Gilt Groupe. "Every day we offer insider access to a variety of exclusive products, and this sale allows us to extend that with the opportunity to buy a sophisticated and stylish car at an insider price." "Partnering with Gilt was a natural fit for Volkswagen as both brands have customers who value style, sophistication, and quality products at an attainable price," said Tim Ellis, Vice President of Marketing, Volkswagen of America, Inc. "By creating a special price of $5,995 for each Jetta on Gilt, Volkswagen has taken our tagline, 'Great for the Price of Good' to a new level that will certainly create excitement and attention." On December 15th, the sale will only be accessible through Gilt mobile applications on the iPhone, iPod touch, iPad, and Android devices. On December 16th and 17th, the sale will take place on Gilt.com as well as through the mobile applications. 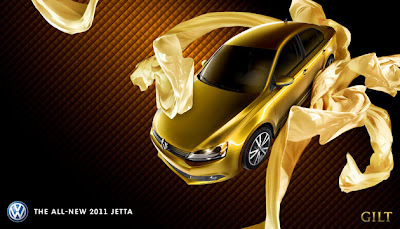 Each Jetta will be presented in a one of a kind "Gilt Gold" wrap and nearly $18,000 in proceeds from the Jettas sold will be donated to the charity Dress for Success. Post-sale, Volkswagen will offer Gilt members who add the Jetta to their "Wait List" a special incentive that can be redeemed at participating Volkswagen dealerships nationwide. The all-new 2011 Jetta delivers sophisticated style, precision German engineering, and Carefree Maintenance, all at an extremely accessible starting price starting at $15,995. In addition, the Jetta offers best-in-class rear legroom and features clean lines, refined side architecture, and premium style combined with Volkswagen's trademark precision German engineering. The all-new 2011 Jetta sets a new standard in its class and became available in U.S. showrooms in October.